While heading towards the national puppet theatre, I recalled my most memorable school trip to watch the legendary puppet musical, Al Leila al Kebira (The Big Night), where I was taken into a fantasy world of imagination. All this came to mind as I walked pass the motionless puppets on display at the entrance of the puppet theatre, to attend Mohema Rasmya (Official Assignment), the outcome of a workshop on puppets, shadow puppeteers, black theatre, story-telling, and a mix of live acting with puppets, directed by Mohamed Fawzi, an actor, dancer and member of the puppet theatre,. Through this workshop, Fawzi integrated all the above arts with numerous sketches. The performance, which represented Egypt for the first time in Mexico, opens to the story of a puppet creator, who carries sandouk el donya (the world in a box – an old manual device in the form of a box with numerous glass displays showing sellouts in motion) and roams the city at night, whether dry or raining, to maintain his street art. Within this context, we watched numerous sketches such as clowns, marionettes, oriental dances, mizmar (oriental flute) music, tannoura (folk dance), and mawlawia (whirling Sufi dervishes), along with many performances of black theatre and satirical skits. From the scenery and costumes by Siham Kamal, the music by Amir Salah el Din, to the lyrics by Essam Tawiq and co-writer Rasha Abdel Moniem, the show was a delight. Through a handful of talented performers such as Adel Othman, Reda Hassanin and Hisham Ali who are passionate about this art form, we were given a cheerful theatrical performance. Shown at the same time, another piece by the same director, Saed al Ahlam (Fishing for Dreams) was an adaptation of Palestinian folk-tales, resembling the tales of the Arabian Nights, yet in a different context. Fishing for Dreams is about a poor fisherman who lives in his own dream-world where he falls in love with Nour, whom he wants to drag into the real world. 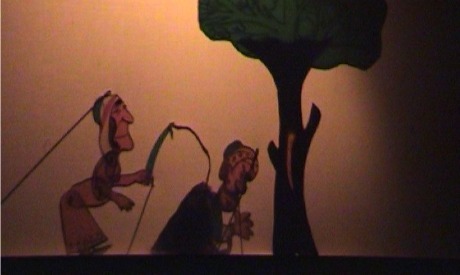 Scriptwriter Rasha Abdel Moniem created this folk-tale through the art of story-telling and Fawzi mixes storytelling with shadow puppets for an enchanting performance, where actors alternate between being silhouettes and acting. This magical mélange ends with an emphasis on the world of stories that still lives in us as long as we can think, dream and remain passionate. Throughout both performances, Fawzi managed to revive our folk heritage by breaking away from the traditional usage of puppets, as he enabled both the puppet and puppeteer to act face-to-face. Fishing for Dreams is playing until 24 January, at the Al Ghad theatre at 9pm daily, except Mondays.